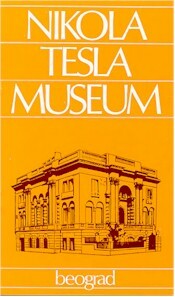 The guide book for visitors touring through the Nikola Tesla Museum in Belgrade, Yugoslavia. "The world, I think, will wait a long time for Nikola Tesla's equal in achievement and imagination." The exhibition of Tesla's creative work begins with his amazing "fairy tale of electricity" in which he with poetic inspiration shows how the human mind gradually grasped the secrets of electricity in the course of history. The "fairy tale" begins with the ancient Greek philosopher Thales from Miletus and with his meditations about the mysterious sparks which appear when rubbing amber (electron), up to contemporary researchers Gilbert, Franklin Galvani, Volta, Oersted, Faraday and Tesla. The group of Tesla's patents from the field of generating, transmitting and using polyphase alternating currents from the period between 1887 and 1890, represents the foundation stone of the present-day electroenergetic epoch. These patents guarantee the discoveries of induction and synchronous motor, of the generator and transformer of polyphase alternating currents, of the ways of connecting the electric circuits and of various other inventions tn this field. 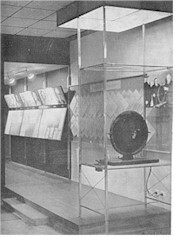 The photograph and the working model illustrate Tesla's first induction motor for the two-phase alternating currents.